Friday October 11th at the BVA hall. 7.15 for prompt 7.30 start. Teams of 6. £7.50 per head which includes a ploughman’s supper. Bring your own drinks and glasses. Book your teams with Norma Barrow. As always I promise the the questions will be doable! The annual Christmas Craft Market will be taking place at the Bradfield Community Centre from 10am to 4 pm on Saturday 24th November 2018. Tombola: This stall always raises a lot of money; however we do need to collect about 200 prizes. We are looking to collect tins, bottles, small gifts, beauty products anything that is in date and in new condition. A box will be placed at the back of the church for these items 2 weeks before the event. No electrical items please. Cake stall: Please let Christine Bowen or Barbara Coe know if you are able to make cakes. They would prefer large cakes, but if you are making small please package in 4/6. Help: This is needed in three areas. Please let me know if you are able to help with any of them! 1. Friday evening. We would appreciate some help moving tables from the church and setting up, putting up lights, decorating tree etc. 2. Door and stalls need to be manned all day. Can you spare and hour? 3. Clearing up at 4pm on Saturday and returning equipment to church. Our annual Christmas Craft Market will take place on Saturday 25th November at the Bradfield Community Centre. 10am to 4pm. There will be a variety of good quality craft and food stalls. Refreshments and light lunches will be available. We hope that Father Christmas will be joining us once again. There will also be raffle and tombola stalls. Entrance £1 accompanied under 16 free. Clear up day. The churchyard committee are asking for help on Saturday 15th July 10am to 12. If you would prefer an earlier start, there will be people around from 9am. Please bring any useful tools for edging, weeding, cutting etc. There are many jobs large and small. If you are unable to attend on this date but would like to help, please contact Jennie Brightman (01206 391091) for information on jobs needing attention. There are 16 gardens and the church open on 25th June. Programmes are available from the Village Shop in advance or the Church on the day. Accompanied children go free. The garden at Ballister House has over the last few years been transformed from a building site. A sculptural approach to gardening has created curved rolling banks, a natural approach to planting and the installation of ponds to encourage wildlife. Extensive views of the river. It is anticipated that the garden railway will be completed. There is no parking here apart from two spaces at the bottom of the garden which will be for less abled people. A large cottage style garden laid to lawn with flower borders, also decked and shingled areas. Plenty of seating available. We will again be serving ice creams and will have a bric a brac stall. "A small cottage garden, planted with love"
A very small front garden, containing pots and baskets which are always full of interesting plants. 5 St Lawrence Church The Street - PROGRAMMES. Service 10.30-11.30 approx.The proceeds from Open Gardens are towards the repair and maintenance of the church. Following the service the church will be open for you to visit. Take the weight off your feet and enjoy some Bradfield vistas. The garden is only one year old, but it is gradually transforming into a peaceful, relaxing setting. Come and see how far we have got. Chips and Ices, Objet A’rt available also for those who would like to know the story of Acorn Village at Mistley a personal book signing will be available. We look forward to welcoming you. A garden developed over 20 years from new with paving, small pond, mixed borders, fruit and vegetables. A gate leads into a half acre meadow with trees, large pond and ditches to encourage wildlife and flowers (accompanied children only in this area please). Please use entrance at back of cottage and parking is available in the road. Brambles has a country cottage garden, which has undergone some recent changes to make it easier to look after. With trees, shrubs, perennials, and a new pond, to provide a garden for us to relax in and food and shelter for wildlife. See Plas y Coed refence leylandii. This old hedge has been replaced with yew and fencing. Mr Ford is undertaking a restoration of this garden. Old tree stumps have been removed and shrubs pruned and some moved. The large flower bed which was full of ground elder is being cleaned ready for planting next year. Wander round the garden and admire the beautiful mature trees and roses. What would you plant in the bed? We were lucky enough to be provided with a wonderful 'Posh Shed' by the National Gardens Scheme which we would love you to see. Please come and enjoy view from the veranda! The garden has surprises around every corner, with plenty of places to sit and contemplate, or just drink in the peaceful atmosphere! As Kit is an artist and has a keen interest in photography, there are always paintings to see in the conservatory and the new etching studio/greenhouse, which also houses exotic plants such as coleus, begonias, cacti and whatever else Ceri succumbs to from visits to nurseries! All visitors are assured of a warm welcome. A mature secluded garden with a variety of shrubs and pots. Time for a sit down to enjoy tea and cakes and a chance to browse the book stall. Wander around the garden and admire the beautiful trees planted over the last 30 years. As Ellis Road is single track, NO car parking is available. Gravel garden to the front featuring hostas and a medium sized rear garden largely devoted to herbaceous plants with splashes of annual colour. A model railway will be running in the garage. A secluded, level, easy access garden with trees, shrubs, climbers, roses and a small pond. Some replanting is taking place following the removal of a row of overgrown leylandii. 17 Rowan Steam Mill Road - Mr and Mrs Coe Plant stall. A new garden, less than a year old. Planted mainly with shrubs and perennials, keeping colour and foliage in mind for flower arranging. Once again this will take place at the Bradfield Community Centre from 10am until 4 pm. There is always a wide range of good quality craft objects and food on sale together with raffle , tombola,and refreshments. Father Christmas usually manages to make an appearance as well. Murder Mystery Evening - including supper. Bradfield Community Centre 7.15 for prompt 7.30 start. Curry Night Wednesday 7th September The Mogul Manningtree 7pm for 7.15. The Mogul restaurant in Manningtree has very kindly offered to host a charity dinner for the Friends of St Lawrence Church. The curry meal (£20 a head, £5 of which would go to the Friends) will include a starter, a choice of mild or medium main course, vegetables, pilau rice and naan bread. Drinks and poppadums will be extra. If you would like to attend please let Sue Cunningham know on 01255 870154 or email sue.cunningham1@btinternet.com by the end of August. Those of you who have already expressed an interest will need to confirm your places with Sue Cunningham. Please encourage friends, family and neighbours to book their places. Unfortunately Con Spirito have had to cancel this concert. We will look to replace this with another event. Once again Kathy Wilkinson has gathered a wide range of good quality crafts for this event. This year there will be stalls containing shabby chic homeware, .ceramics, pottery, wooden items, knitwear for all ages, jewellery, cards and artwork, knitted and sewn toys plus much more. Food stalls include the Pieman, Gina’s Jams and Chutneys and homemade cakes. There will be the usual raffle and tombola with refreshments served all day. Father Christmas will return with stories and presents for the children £2 per child. Unfortunately due to organisational difficulties this event has had to be cancelled. We hope to replace it with another event. So far we have about ten garden owners willing to open this year. If you are resident in Bradfield and would like to know more about opening your garden for this event, please contact me norma.barrow@keme.co.uk tel:01255 870681.If you are able to supply plants or cakes for the stalls please contact me at the above number. Details of the gardens which are opening will be posted here in June. This book tells the story of Bradfield’s parish church from its earliest origins and traces changes made to it and the Christian faith over the centuries. The profits from the book, which is priced at £4.99, will be going to the Friends. The book may be purchased at the launch, or after the event from the Village Store and Post Office or from Bob Coe tel: 01255 870123. The Mogul restaurant in Manningtree has very kindly offered to host a charity dinner for the Friends of St Lawrence Church on Wednesday 18th March at 7pm. The curry meal (£17 a head, £5 of which would go to the Friends)) would include a starter, a choice of mild or medium main course, vegetables, pilau rice and nan bread. Drinks and poppadoms would be extra. If you would like to attend please let Sue Cunningham know on 01255 870154 or email sue.cunningham1@btinternet.com by the end of February. Those of you who expressed an interest will need to confirm your places with Sue Cunningham. Please encourage friends, family and neighbours to book their places. This will be held on Friday 23rd January 2015 in the Church Room. 7.15 for 7.30 start. Tickets are limited so book early email norma.barrow@ keme.co.uk! £25 per head for three/four course meal: Seafood starter, Haggis (vegetarian Haggis available) Please inform us if you would prefer the braised beef alternative or vegetarian starter. Sweet/cheese course. Andy and his bagpipes will be with us again so come along and enjoy a sociable evening. The Friends will be holding its Christmas Craft Market on Saturday 29 November this year at Bradfield Community Centre (CO11 2UU) from 10 am until 4 pm. As usual there will be craft and food stalls, refreshments, raffle, tombola and Father Christmas will be honouring us with his presence once again, so bring your children/ grandchildren along to meet him, for a story and to receive an age related gift - £2 per child. Admission to the Craft Market is £1 with accompanied children under 16 free. Please contact Kathy Wilkinson on 01206-393904 if you require any further information. We are pleased to welcome back Susie Hyman and her friends who make up Con Spirito, for another concert at St Lawrence Church. The concert will be followed by a finger buffet.. 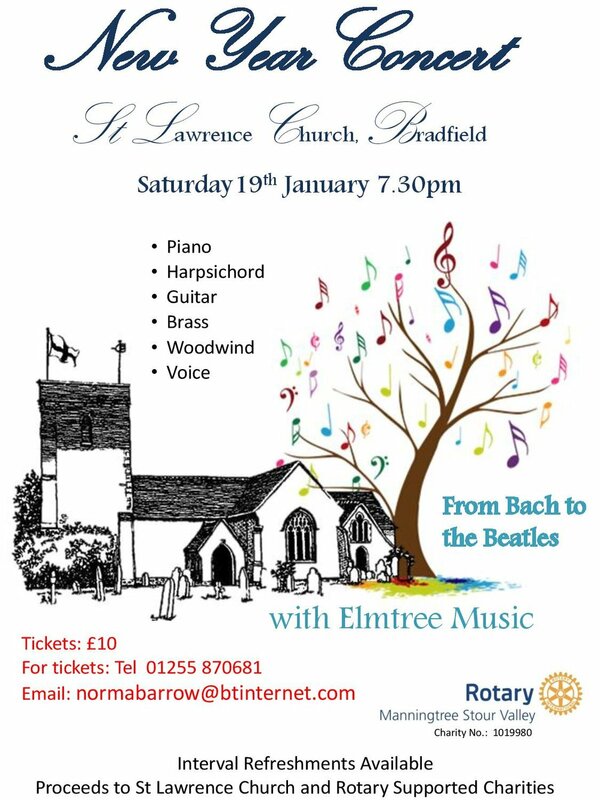 The Friends of St Lawrence Church Bradfield is a separate registered charity, quite distinct from the church, and has been established to help support St Lawrence Parochial Church Council (PCC) in the preservation and restoration of the church.